It's now easier than ever to find all of the apps related to the University of Pittsburgh. The Pitt App Center in AskCathy delivers dozens of Pitt-related mobile apps from one convenient location. There are thousands of apps out there. The Pitt App Center collects and organizes only the apps that are relevant to your Pitt experience. Install apps that allow you to add classes, view grades, check your schedule, store and share documents in the cloud, watch training videos, use Microsoft Office, read campus news, prepare for career fairs, digitally sign documents, and much more. Find information on how to distribute your apps to small groups and beta testing. Access device specific developer resources to begin building your own apps. 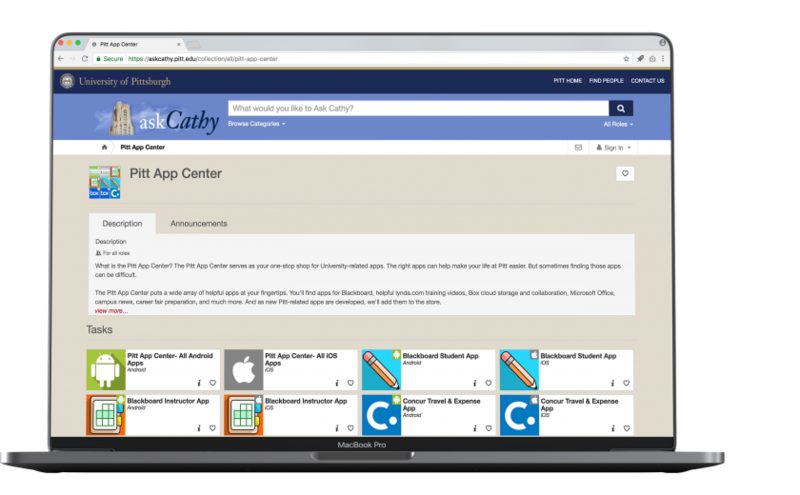 Visit the Pitt App Center in AskCathy to browse all available apps or go to your device-specific listing to narrow down the selection. What Can You Find in the Pitt App Center? A wide range of apps are already available and more are on the way. *Available for students; faculty/staff should contact Pitt Information Technology for licensing information. Have a Pitt-Related App You Think Should Be Included? If so, we want to know! Contact the 24/7 Help Desk online or at 412-624-HELP (4357) with the details. We’ll evaluate the app for inclusion in the Pitt App Center. What If I already have the Pitt App Center installed? You no longer need to install anything to use the Pitt App Center. We recommend that you remove the existing app from your device. How do I distribute my app for testing? Can I request to have the University sign my app? You can request to have the University sign your app to be published in the public app stores. Read below for detailed instructions. Interested in having Pitt sign for your new app? You can request to use the University's app signature before submitting to the Apple App Store or Google Play Store. Submit a case requesting to be added to the University of Pittsburgh's Apple Developer account. You should receive an email from Apple. Submit a case requesting to be added to the University of Pittsburgh's Android Developer account. Please provide the name of the app (must be a name not already registered by someone else in the app store) in your request.